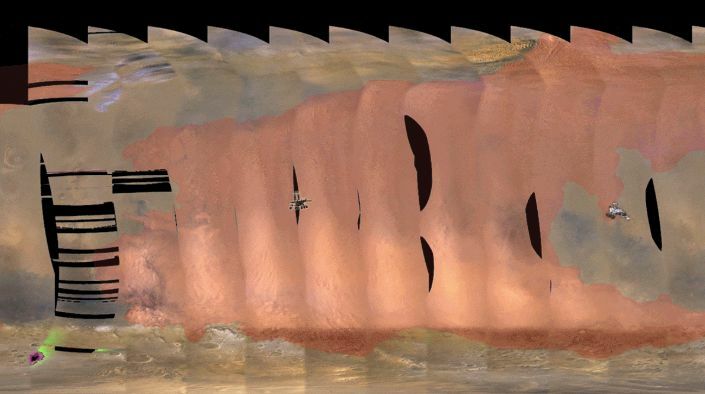 There is a mighty windstorm now raging on Mars. From all indications, it's a whopper, stronger than any since at least 2007 and now covering most of the planet. In the opening scene of "The Martian," Matt Damon battles against a Red Planet gale that blows over equipment and sends objects flying. So you might expect that NASA is busy commanding its rovers and spacecraft to batten down their hatches and find safe havens to ride out the storm. In fact, on June 12, NASA lost contact with the rover Opportunity, located near the heart of the raging storm, where winds may be as high as 60 miles per hour. But the loss of contact is not because the wind has toppled the rover or smashed it to pieces with a flying rock. Real Martian wind storms are less dramatic than you might believe from Hollywood. Mars' atmosphere is only a hundredth as thick as Earth's, so even a full-blown Martian gale wouldn't lift a kite. Opportunity effectively went to sleep for a lack of sunlight. A thick veil of dust blown into the atmosphere by the storm choked off the rays of sunlight needed to charge its batteries. This week, I channeled my worry into designing and stitching this @MarsRovers Opportunity, with blue for the Martian sunrise we are waiting for. On the flipside of the planet, located almost halfway around the globe, the rover Curiosity stands ready to observe. As the storm continues its fury in the days and weeks ahead, Curiosity's observations will provide valuable data on the storm's development, how it effects conditions on the ground, and ultimately how it dissipates. In fact, from the lower slopes of Mount Sharp in Gale Crater, Curiosity has detected an upswing of dust in the atmosphere around it — enough to show up on camera. 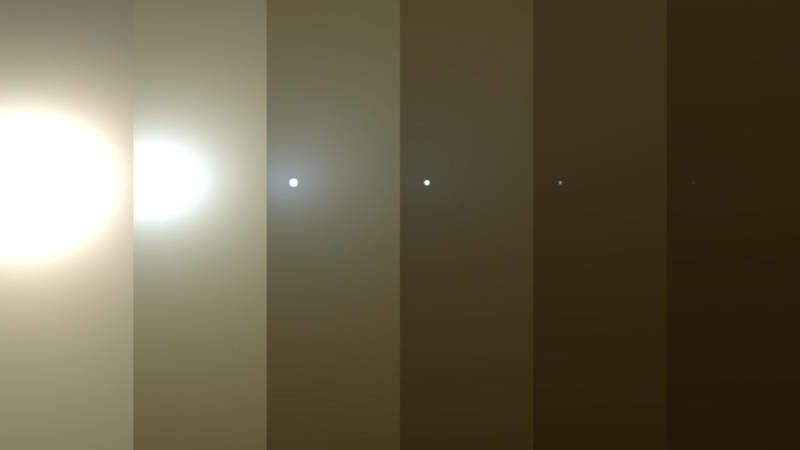 Curiosity is not vulnerable to the choking of sunlight by atmospheric dust, since it is powered by a nuclear generator. In addition to having wheels on the ground to observe this storm, NASA has three spacecraft in orbit that will also make a study of this great dust-up event, each with instruments that offer unique scientific perspectives. The Mars Reconnaissance Orbiter — which originally alerted NASA about the developing storm on May 30 — offers a comprehensive global view with its wide-angle camera, MARCI, as well as the potential to study localized effects with its powerful HiRISE camera. Mars Odyssey can detect and measure dust density and distribution in the atmosphere beneath it, with its infrared camera, THEMIS. 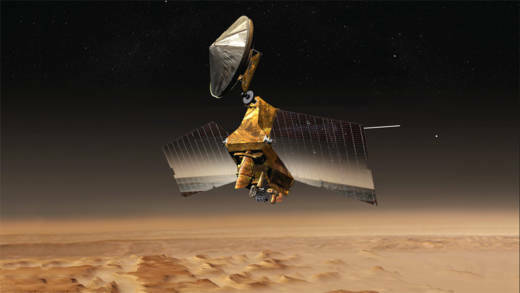 MAVEN will investigate the highest levels of Mars' atmosphere to look for connections between dust storm activity and the loss of atmospheric gases into space, following up on observations by other spacecraft. The three orbiters and one rover will work together to give us a comprehensive look at the storm's effects. Wind storms of different scales occur every Martian year, stirred up by surface heating from sunlight, especially when Mars passes closest to the sun with each orbit. Sometimes, an isolated Martian squall can grow into a much larger storm. And every three to four Martian years (six to eight Earth years) a wind storm can grow to encircle the globe, kicking up enormous amounts of dust that shroud the planet — like the one we're seeing on Mars now. When the first spacecraft to orbit Mars, Mariner 9, arrived in 1971, a major global dust storm was in full swing. Mariner 9 had to wait a couple of months for the dust to settle before it had a chance to take clear pictures of Mars' surface. 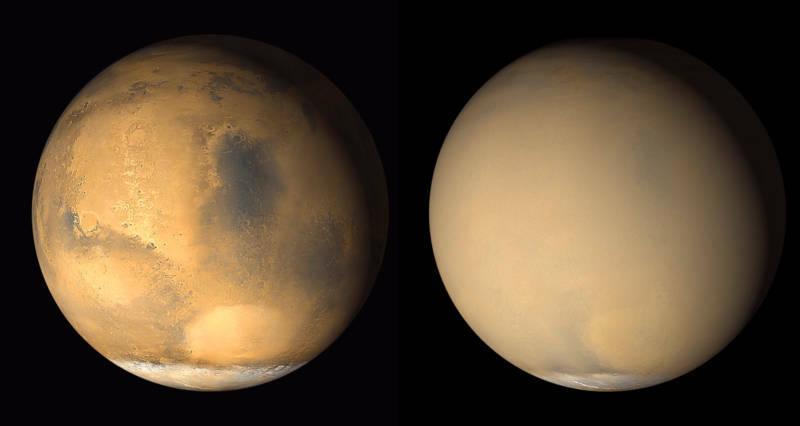 Today's dust-up has now officially grown to become one of these "planet-encircling" or global wind storms, and is already being called the most powerful storm ever observed on Mars. Scientists are hopeful for the windfall of science that may be blowing their way.